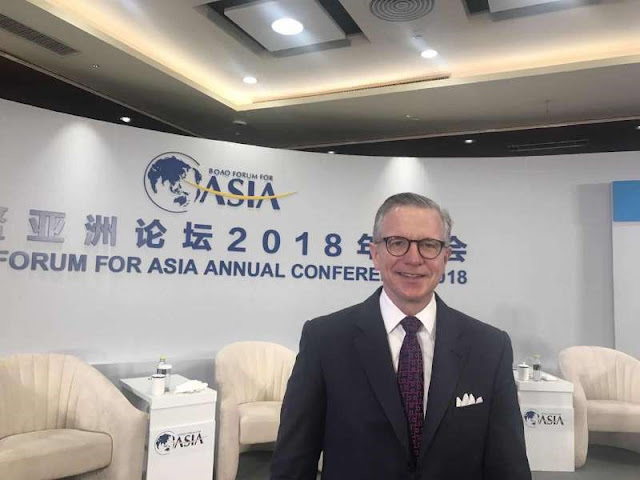 “Extraordinary”, “Sustainable” and “Globally Integrated”: Andrew Geczy, CEO of Terra Firma, one of Europe’s leading private equity firms, chose these three descriptors for China’s changes over the past four decades. This year marks the 40th anniversary of China’s reform and opening-up policy. In Geczy’s eyes, the country has had an amazing success story over the years, while balancing the differences that exist within China. “It is extraordinary because of the 800 million people that have been taken out of poverty and the growth that happened between 1978 and today; it is certainly sustainable in the way of the approach that it has developed both internally and externally; it is globally integrated as it played its part in keeping the global economy growing and has proposed the Belt and Road Initiative,” Geczy said in an exclusive interview with China Daily Website on the sidelines of the ongoing Boao Forum for Asia Annual Conference 2018. Geczy, also one of the panelists participating in a TV debate called “Rethinking Overseas Investment” held during the forum on Monday, said China had been involved in solving global problems and has played a critical role in the global economy. “When you look at overseas direct investment and cross-border mergers and acquisitions, China is number two behind the United States, which reflects the important step China has made in opening-up its economy,” Geczy said. China’s 2017 outbound direct investment slowed significantly and recorded its first annual drop since 2006. According to the Ministry of Commerce, after the boom in 2016, China’s total outbound direct investment in nonfinancial sectors declined 29.4% year-on-year, from USD 170 billion in 2016 to USD 120 billion last year. Geczy said despite the slowdown, the fact China’s ODI went from USD 1 billion in 2000 to USD 120 billion in 2017 should not be ignored. “We should not forget this is an extraordinary growth already and this recent decrease in China’s ODI is actually quite small. It is quite natural after periods of rapid growth there would be a pause. China is still a dominant player in ODI and its scale and scope are very clear,” he added. Last August, the Chinese government released a guideline to further tighten the grip on or ban ODI in sectors including real estate, hotels, entertainment, sports and casinos to avoid investment risks or potential crime. Geczy pointed out it is healthy these steps have been taken, because China’s overseas direct investment will be more rational. What benefits do you think the internationalization of the renminbi can bring to the world? I believe the internationalization of the renminbi will be a benefit to the global economy. It will bring benefits to my business. And importantly, although it might not essentially affect my business directly immediately, I see the internationalization of the renminbi as being fundamental to the long-term growth of the global economy. And we need a stronger renminbi for a stronger global economy. What’s your expectation on the Shanghai-London Stock Connect that is expected to take effect this year? I believe that it will be important, because it’ll bring an opportunity for European capital to work in China and an opportunity for Chinese capital to work in Europe. And I believe it brings greater transparency to the overall financial system. As China takes its role in the capital markets of the world, Shanghai will ultimately evolve to be the one of the global capital trading centers in the world. This step of connecting Shanghai and London is an important one. What’s the biggest challenge China faces today and how can the country overcome it? Shifting from a manufacturing economy to a consumption economy and dealing with the diverse nature of China will be the challenge. I think China needs to continue to take the steps they have been taking over the last 40 years. China needs to continually take step after step in the journey to become globally integrated, an innovative player in the world.